The spook is over, the creeps went home! I for myself spent a lovely night with a friend of mine, watching a movie, drinking a bit and eating way too much pizza. It was a quiet yet funny night since there's not so much you can do on a Monday Halloween night in this hole called Bremen. I always do love me some eccentric, almost disproportionate lashes - this time I used a pair of Dolly Wink one for upper lashes and cut up an old, unloved pair of Claire's lashes for the lower part. Nothing I'd wear in bright daylight for a regular day to work but Halloween has always been a completely different thing anyway. And there goes this years scary daydream again and all that's left is a bunch of candy and sore tummies. Though I'm sure it won't be the last time for me to go all crazy like this so the parting isn't too deep. Now quickly onto another subject: Pastel Raindrops ♪ Giveaway! I just wanted to thank everyone who took part in this to make it such a blast! Seriously, I was simply overwhelmed by all the entries I got for this and surely it'll take me a while to write everybody's name down in my not-so-little list. I'll do my best, though, so I can announce the lucky winner as soon as possible. God you are so pretty Mio!!!! Your eyes look so beautiful and I wish I could pull off the eye makeup you wore and the lashes. That dress is super duper. I'm glad you had a nice Halloween as I did as well! Aww I love love love your lashes and the toys!!! but anyways, lovely makeup and I adore that barbie cam! 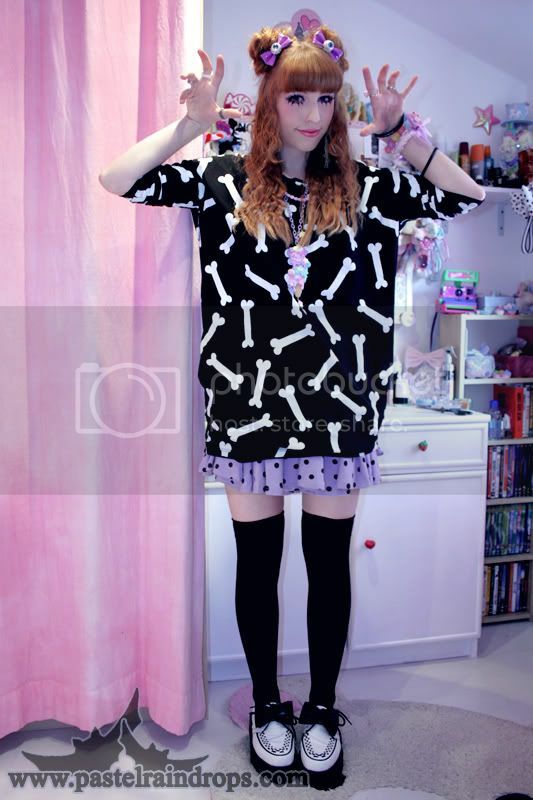 Oh my god you are so pretty and CUTE and so KERA :D I love your look! Love your outfit, it's so adorable! I follow you because I love your beautiful photos! Very cute outfit, I love your hairstyle and the eye things:,D<3! You are just too cute! I love your sweater and that skirt is adorable! aww love the outfit ^_____^ LOOOVE! Your make up and earrings are really great, glad you had fun- weirdly halloween slipped me by this year- didn't carve a pumpkin or anything- oh dear! Great photos! Have a sweet day! Ahhh-your blog is so so cool! Followed right away :D i love your jumper! 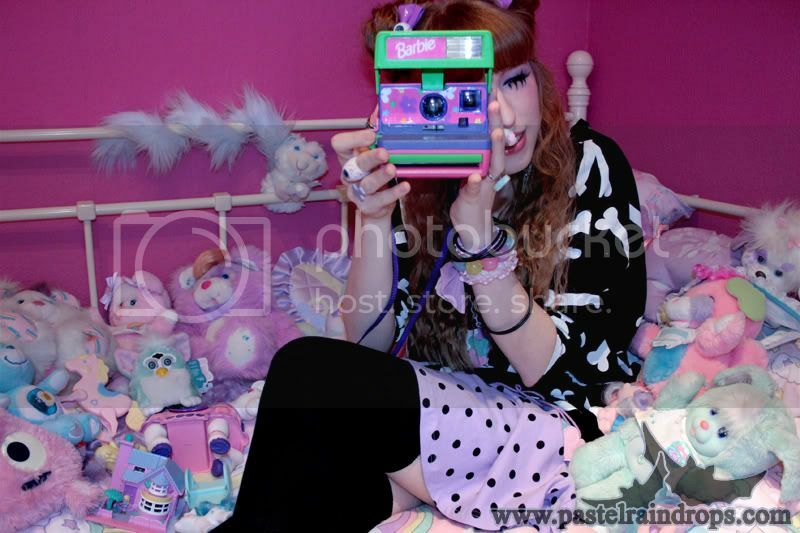 Plus i am liking the furby and polly pockets on your bed, hehe! ah, my goodness! you are the prettiest fairy ever! I love your outfit~ It looks so awesome and cute! I miss your posts; please, come back! I love your hair clip with eyes! This is so creepy and I like that!! Aw~ das ist blöd aber probier's doch mal mit dicken Einlegesohlen? Vllt bringt das ja was? Aw~ thank you for doing so ♥ I hope you'll like it here! Ah~ but carving them is a lot of fun, huh? maybe this year perhaps? ♥ Though I only ever did it once if I remember right. Aww~ that's too much ; u ; ♥ Thanks a lot!